A Time Bank is a community of people who support each other. When you spend an hour to do something for an individual or group, you earn a Time Dollar. Then you can use that Time Dollar to buy an hour of a someone's time or engage in a group activity offered by the community. With Time Banking you will be working with a group of individuals who are joined together for the common good. 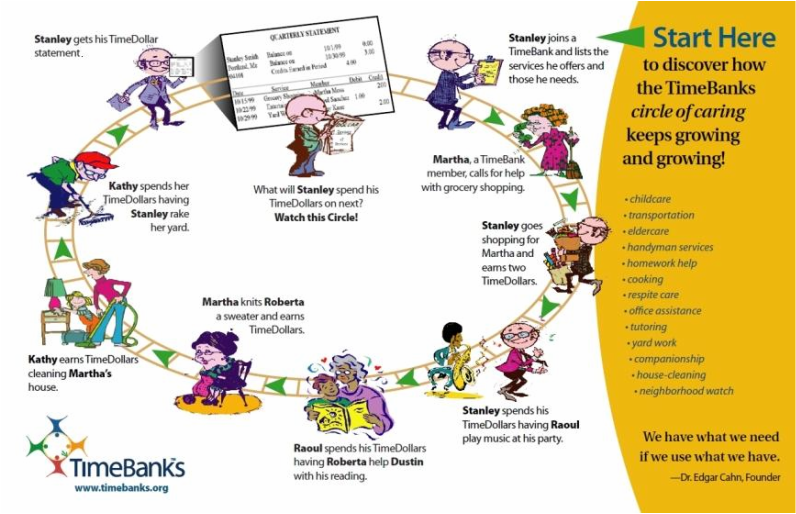 It brings out the best in people, because Time Banking is a system that connects unmet needs with untapped resources. ISN'T TIME BANKING LIKE BARTERING? It is, but the big difference is that you don’t have to pay back the person who does you a favor. It is a “pay-it-forward” system. That’s one of the reasons why people find it so much easier to do things for others in a Time Banking system. You don’t have to figure out what to give back to the person who helped you. You can choose how to pay it forward doing what you want, when you want. Also, with bartering there is a negotiation process, whereas with Time Banking there is no negotiation. The Tapestry is founded on the principles of community and inclusion. We believe the most successful Time Bank would be one in which participants feel safe in seeking the assistance of it's members. We provide screening to manage the risks which are innately present in society. The process will determine the level of participation of each member and the guidelines for exclusion, if deemed necessary by a review board. This system is not intended to guaranty safety, but to minimize the risk of involvement, as stated on the application. WHY IS ATTENDING THE MEMBER POTLUCKS IMPORTANT? The member potlucks are a great way to get to know more about your fellow members and learn about how we can help each other. Meeting each other on a regular basis builds trust that is necessary to make the time bank more effective for everyone. Please check the main page for upcoming social dates and times.